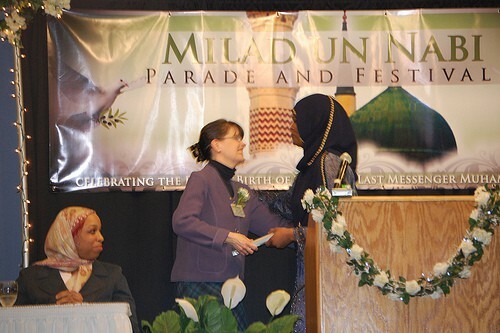 March 14 in Binghamton, New York, marked the third celebration of the annual United Muslim Christian Forum’s (UMCF) Eid Miladun Nabi Parade and Festival, a continental commemoration of the birth and life of the Holy Last Messenger, Muhammad, as well as the mission and majesty of Jesus, son of Mary (peace be upon them). The blessed occasion was first conceived when it was recognized that both Muslims and Christians had been manipulated into fighting senseless wars against each other resulting in large loss of life and the escalation of horrendous human suffering. The tragedy of September 11th was still vivid in the minds of Americans and the phobia that Islam was a threat to America and the West was increasingly perpetrated by western media. UMCF, an interfaith advocacy organization, knew that there were very devious elements that were instigating a clash between Christians and Muslims here in America and that if they were not stopped a war -from which America would never recover- would spell the destruction of America and the world. The UMCF was founded over three years ago by His Eminence, El Sheikh Syed Mubarik Ali Shah Gilani, El Hashmi, Imam of the Muslims of the Americas Inc., Vice Chancellor of the International Quranic Open University Inc. and a Sufi Master El Sheikh Gilani foresaw UMCF as a legitimate vehicle through which an end to all wars and human suffering could be achieved. To counter the vicious religious bigotry and highly combustible rhetoric that was being broadly disseminated, UMCF embarked on a campaign to educate a largely naïve public to the many similarities present in the two great religions of Christianity and Islam. UMCF quickly took the initiative to highlight the shared reverence that both Christians and Muslims have for the blessed Jesus, son of the chaste Mary, as well as the many references to both these blessed souls in the Holy Quran. During a “heartfelt” address UMCF Board Member and guest speaker, Professor Diane O’Heron of Broome County Community College remarked , “We can no longer let Christians say something bad about a Muslim without correcting them, and Muslims should not stand by and let Christians say what is not true about Muslims.” We have to do more things together. The program went a long way in dispelling the negative stereotypical images of Muslims so cleverly propagated in today’s media All the speakers concurred that Muslim/Christian unity was the only solution for world peace. International Quranic Open University Inc.